p.r.n. Para Transit offers alternative transportation options for the elderly and disabled that allow them to maintain their independence and enjoy a self-sufficient lifestyle. Our service is available from 6 am to 12 am, 365 days a year for both local and long distance transportation. We take a door-to-door, "hands-on" approach that means assisting your family members in and out of the vehicle as well as accompanying them to the door and helping them with bags or luggage. The safety of your loved ones is our number one priority. We're trusted experts and a dependable community partner. Our customers count on our reliability, the quality of our care, our dedication to our clients, and our high level of efficiency. Car for Hire: An exclusive ride to your destinations that includes passenger assistance provided by trained drivers. Our Car for Hire is an excellent alternative to a taxi service for those who require help getting in and out of the vehicle, guidance from door to door and/or assistance with bags. 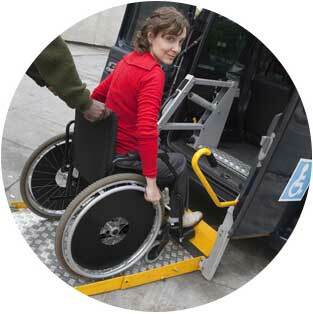 Wheel Chair Service: Available for local as well as long-distance destinations, our ADA compliant vans with hydraulic lifts ensure ease of boarding. The vans also feature three-point tie-downs that offer secure forward-facing seating for those who use wheelchairs or scooters. All p.r.n. drivers are highly-trained in assisting seniors and persons with disabilities. Group Service: Convenient 12-passenger vans operated by professional drivers who are ready to transport elderly passengers to group outings such as luncheons, shopping trips, movies, weddings, etc. To book any transportation services for your senior or handicapped family member, please call at least one day in advance. To ask a question or book transportation services further into the future, contact us online.